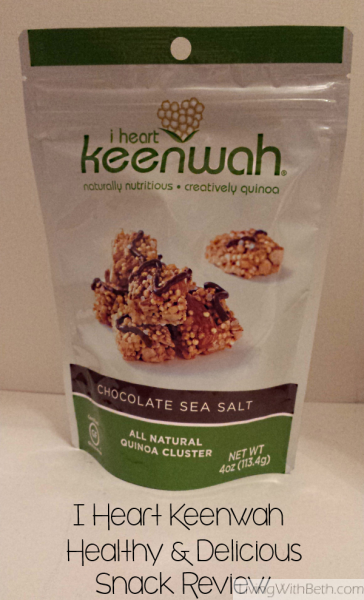 Made from quinoa (pronounced keen-wah), vegan and certified gluten free, I Heart Keenwah was a big hit in my household. 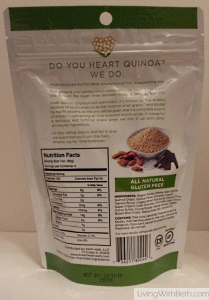 I received sample bags of I Heart Keenwah in return for this honest evaluation, and they were so delicious that I had to hold back the troops from eating them all before I could taste the product and take some photos. This post contains affiliate links; please read my disclosure here. By “the troops,” I mean my 11-year-old and 5-year-old daughters. My older daughter is normally somewhat picky about what she eats. She’s always willing to try my review products, though, and she gleefully plowed through the I Heart Keenwah. 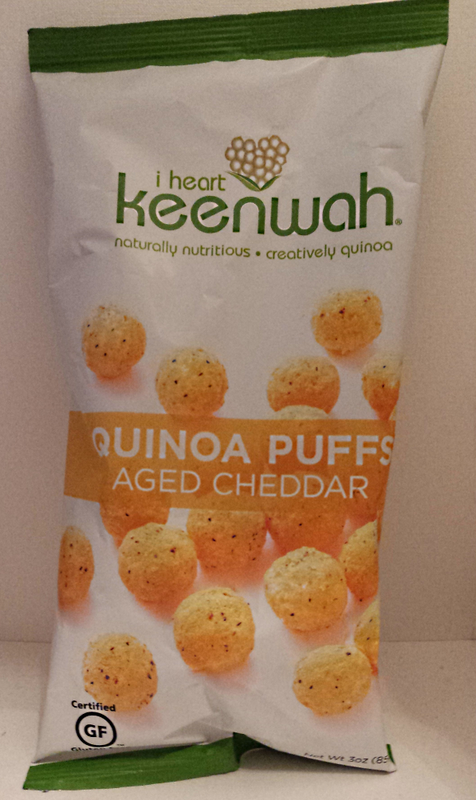 Quinoa is a type of high-protein grain, and I Heart Keenwah snacks are made in the USA from imported ingredients – mainly Bolivian quinoa. 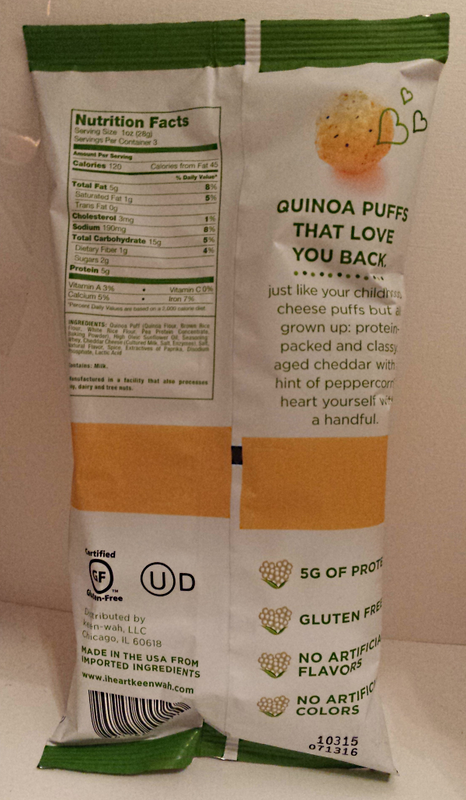 We first tried the three-ounce bag of Aged Cheddar Quinoa Puffs , which contain 5 grams of protein per 1 ounce serving, along with 120 calories, 5 fat grams and 15 carbs. 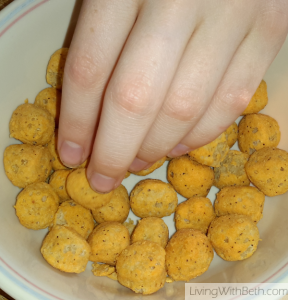 The puffs contain no artificial colors or flavors – just things like rice four, spices, sunflower oil and white cheddar. Next, we broke open the Quinoa Cluster Chocolate Sea Salt 4-ounce bag. 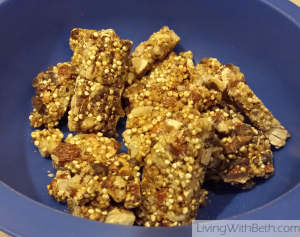 These crunchy delights contain 130 calories per 1-ounce serving, with 6 fat grams, 18 carbs (including 7 grams of sugars) and 3 grams of protein. 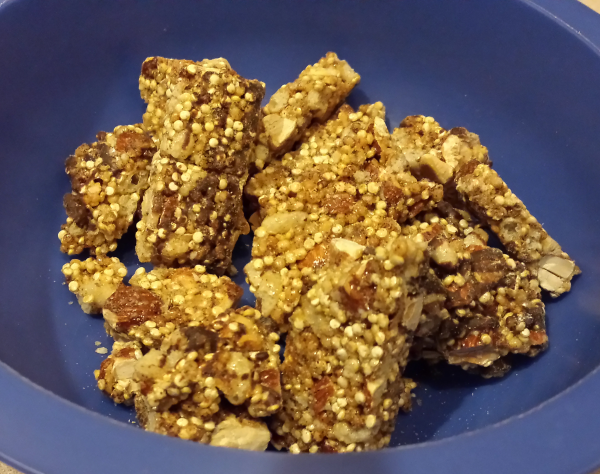 In addition to organic quinoa, these quinoa clusters contain almonds, organic tapioca syrup, organic brown rice syrup, organic cane sugar, organic dark chocolate, organic brown rice crisps, baking soda, salt and almond oil. The clusters taste incredibly yummy and have just the right amount of crunch without feeling like you’re going to break a tooth. 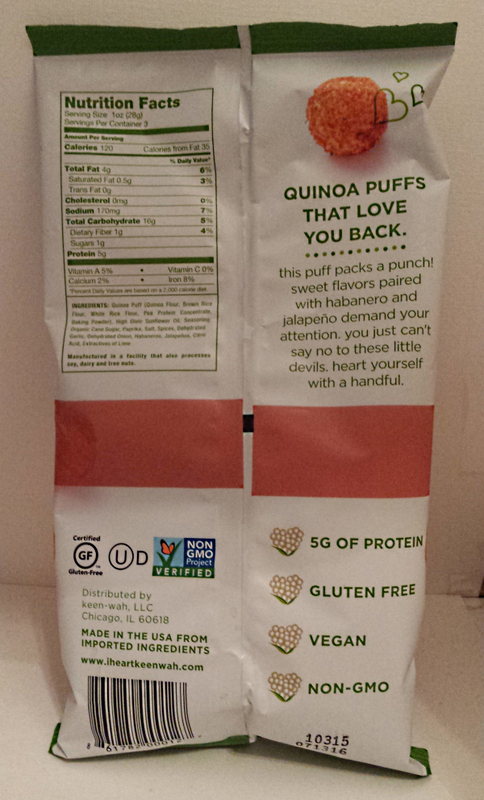 Next, we tried the third and final sample bag, the Sweet Chili Quinoa Puffs , which are similar in texture to the Aged Cheddar Quinoa Puffs. The taste, however, is completely different, with a spicy kick to it. 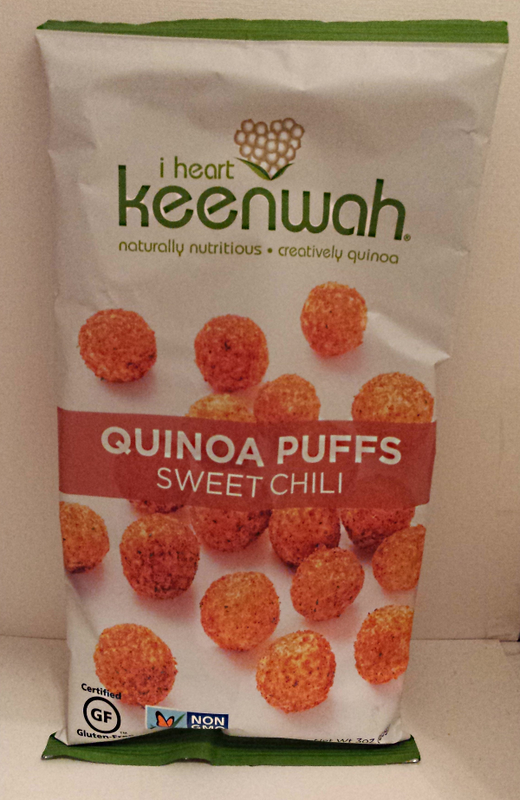 My older daughter said, “Even though they set my mouth on fire, they’re delicious.” I have more tolerance and appreciation for spicy foods and found the Sweet Chili Quinoa Puffs to offer just the right amount of bite to them. 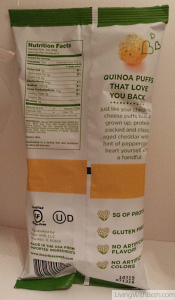 The Sweet Chili Puffs contain 120 calories per 1-ounce serving, with 4 grams of fat, 16 carbs (encompassing 1 gram of fiber and 1 gram of sugars) and 5 grams of protein. 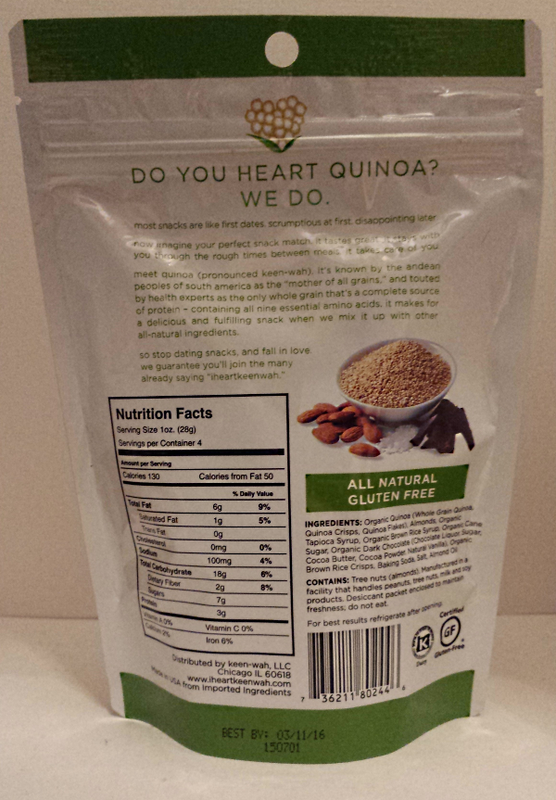 Quinoa comes from South America and is the only grain which provides a complete protein, packing all nine amino acids. In addition to being gluten free, quinoa is also low glycemic, high in fiber and loaded with plenty of protein, vitamins and minerals. I Heart Keenwah’s founders chose to produce quinoa-based products because of the grain’s numerous health and nutritional benefits, and they’ve certainly succeeded in manufacturing some dynamite snack foods. I Heart Keenwah offers snack foods that are not only extremely tasty but also much healthier than the average munchies. If you’d like to try cooking with quinoa, check out this great list of quinoa recipes featured on From This Kitchen Table. If you enjoyed this post, could you please click here to give it a G+1 and leave a comment below?